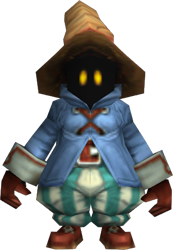 Vivi is one of the main characters of Final Fantasy IX and occasionally acts as the player character during the game. Vivi begins the game as an extremely shy, innocent, and naïve character, but grows more confident and self-assured as the game progresses, significantly aided in his growth by Zidane. Vivi is visiting Alexandria at the beginning of the game after traveling to the city from his home near Treno in order to watch the play. After his ticket is revealed to be counterfeit, he follows Puck to the rooftops to try to catch the show for free. Vivi ends up on stage as the theater ship attempts to make its escape with the kidnapped Princess Garnet, and joins the group with little prompting as they work to bring her to safety. Vivi is a magical character in battle and acts much like a traditional Black Mage in the Final Fantasy series. Vivi equips staves, robes, light armor, and light headgear. He is one of the strongest magical attackers in the game. 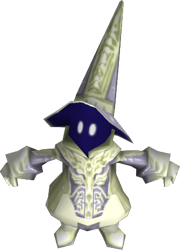 Vivi has two unique commands in battle: Focus and Black Magic. Focus allows Vivi to increase his magic power, which is extremely useful when used multiple times in a single battle. Black Magic allows him to cast offensive spells at an enemy. Additionally, if Vivi is in the party with Steiner, Steiner can utilize Vivi's learned magic to augment the power of his sword. When Vivi enters Trance, he turns entirely black and white and his robes become much more ornate. His Black Magic command turns into Double Black, which allows him to cast two Black Magic spells consecutively. Each casting uses the appropriate amount of MP and decreases the Trance gauge separately, though the amount of the gauge used per spell is less than most characters use for a normal Trance command.